Don's Dimensional Shift: Soulmates RELEASED! 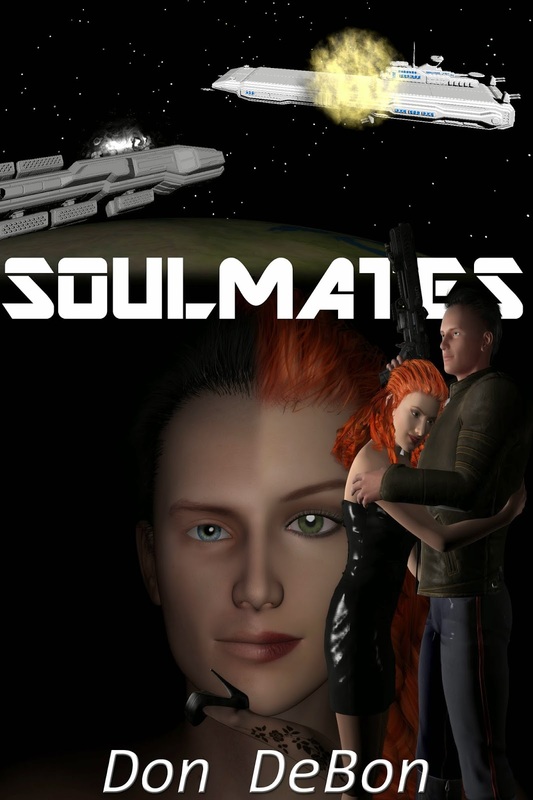 I am pleased to announce that my latest book SOULMATES is now available on Amazon Kindle, Apple iBooks, Nook, Kobo, Scribd, Smashwords, and Oyster! Plans are in-work to bring it to print soon as well. Stay tuned for updates! The holo projector building shook as raw power flowed into the dish. Building exponentially until a large beam shot up out of the center and hit the Mechand ship head on, blasting right through the middle section. Time seemed to stand still as the beam rapidly increased in size until it was the full size of the building. The ship hovered helplessly as if speared through the heart. Then the beam grew in size again into a full conical blast that totally engulfed the ship. Fire buried from the inside out in a ever expanding plume of destruction until it disintegrated as though it never existed. The building shook again but this time for a different reason. The automated voice boomed over the speakers. "Warning! This facility will overload in two minutes! All personnel must evacuate immediately!" Deven hopped into the drivers seat. "I'm driving." But the car refused to power on. Aleshia hit the overdrive dialing it to maximum. They were slammed back into their seats with the sudden acceleration as the holo projector reached critical mass. The large dish shuddered and folded in upon itself, then exploded in an ever growing fireball. Microseconds later it engulfed the entire complex and continued to expand. Fire lashed out at them, and melted a tail light before they were out of range. Red hot lava broke through the surface incinerating anything not already blasted and burnt beyond recognition. Several large jets of lava shot up over two thousand feet into the sky with the pressure fully released, then came back to earth as large solidified rock. A new volcano was born.